Question: Many street rods are now incorporating computerized engine controls, fuel injection, and other electronic engine controls. What are some basic principles and concepts that will help to understand engine computer systems better? 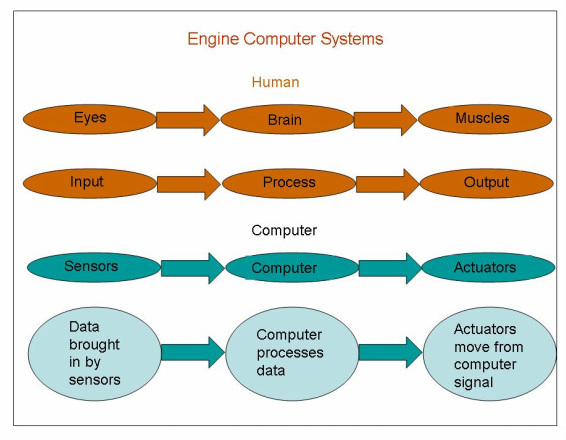 Answer: To understand engine computer systems the first thing to know is the principle of “input, process, and output.” Refer to the illustration to the left. The five senses of a human being are sight, touch, smell, hearing, and taste. In this example, the eyes are considered one of the five inputs to the brain. The brain takes the information from the eyes and causes muscles to react accordingly. Therefore, there is an input (eyes), process (brain), and output (muscles), which causes the body to move accordingly. --a sensor measure the exact rpm. --a sensor measures the exact position of the throttle. --a sensor measures the exact crankshaft position. --a sensor measures the exact camshaft position. --a sensor measures the A/C on or off condition. --a sensor measures the transmission gear being used. --the position of the exhaust gas recirculator valve (EGR). --the exact amount of fuel for the port fuel injectors. --The position of the idle speed motor to set the idle speed. --The on and off position of the coolant fan. --The amount of charge going to the alternator. --The settings on the carbon canister. The types and number of inputs and outputs will be determined by the vehicle make and year. In practice, the input, process, and output data occur many, many times per second. 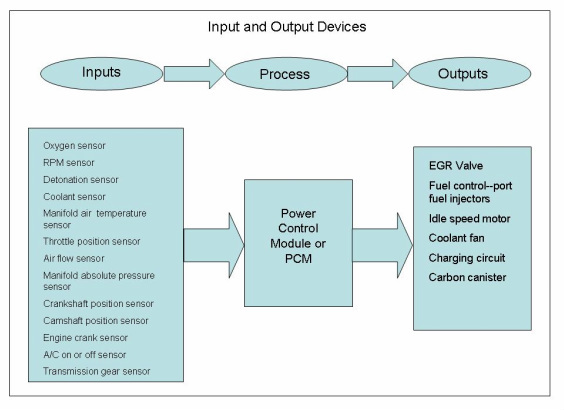 The end result is that the computer can monitor many inputs and make continuous decisions to control various outputs, to keep the engine running most efficiently under all conditions.